Thread: New machine...Coffee is bitter ..is it the tamp or grind or amount ??? Not sure which forum to post this. I've been using Breville Romas for over 15 years .....pretty happy with it ..sometimes my FW is weaker than others but always ok. ..machine died...upgraded to Breville Duo TEmp. grinder is sunbeam em0480 which I've had for 4-5 years . I'm getting weak crema and bitter coffee almost every time . ... Was lucky to get a free 1.25 kg of beans....so I've been happy to throw beans away as I experiment...but after 3 weeks I'm really not getting it sussed. Last edited by grapsta; 23rd August 2018 at 12:01 PM. The honest answer to whether it is grind, tamp or dose is that it is all 3 as they are all linked to how the shot will pour. In general the biggest difference will come from grind size and dose - tamp is usually more of a 'fine tuning' tool. Your best bet is start off with what is the recommended dose for your basket size - I think 15g for the breville double baskets, but someone could probably correct me here. From there I would only play with the grind size until the pour is pretty good. Look for about 30ml of liquid in 30 seconds. If you get 50ml in 30 seconds, then try grinding a little finer until it's closer to 30ml. similarly if it's more like 10 ml in 30 seconds then try a larger grind size. Try keep a similar firm tamping pressure. Try each shot you pull until you find something you like the taste of - this is very subjective and you might find you like a shorter shot (more like 25ml as I do) or a longer one. Once you have that down to something pleasant I would then try to change the dose a little. Maybe go up 1/4-1/2 a gram and see how this changes the shot profile - don't change the grind size just yet! Try a few grams up and a few grams down. See what this tastes like - do you like it? If so, great! If not, try something else. You can then start to tinker with grind settings. If you go up 1 gram, you can dial back the grind size a little. Similarly if you go down in dose, grind a little finer. Also try use fresh as possible beans - within 1 month of roasting. that 1.25kg roast could be months post roast (hence the freebie!). Don't forget it is all about taste - if it don't taste good, you are doing something wrong. keep trying new things until you get something drinkable. Once you find the drinkable spot, tinker until it tastes great! Thanks so much for the reply ....I may have to print your reply out and stick it on hte wall near the coffee machine ...cheers...I'll give all that a go tomorrow. How exactly do you measure the dose are you using kitchen scales every time to grind a shot out ? ...... also measuring the mls of coffee expressed - I'm guessing Ill have to use a shot glass etc until I'm know what 30 or 20 mls looks like . How exactly do you measure the dose are you using kitchen scales every time to grind a shot out ? ...... also measuring the mls of coffee expressed - I'm guessing Ill have to use a shot glass etc until I'm know what 30 or 20 mls looks like . Get your kitchen scales, place group head on them and zero out the scales. Grind into the group head and place back on scales. I do the same with the cup im pulling the shot into. 1g = 1ml (close enough). That would be a very challenging exercise. I assume you mean the portafilter? That's correct, kitchen scales work great. Normally I will weigh out my dose prior and grind only that amount. And drwharris is correct 1g = 1ml or close enough. I bought a jewelers scale from ebay for about $10 which goes down to 0.01g (probably not super reliable and there are better ones out there) but my kitchen scales only did to the nearest 1gram. Yeah I may need better scales... And perhaps a grinder upgrade too. I actually forgot to mention something that's no doubt important... Which is I'm using the double basket to make one coffee.... This was the way to get good coffee on the last machine. Perhaps I need to try the single first. Stick to the double basket, once you have that figured out you can attempt the single if you're so inclined. The single will require much more finess than the double to get right. Get some scales that go to 0.1g, and measure your weight in and weight out, forget volume entirely. Aim for a ratio of 1:2 (grinds weight in : liquid weight out) to start with, adjust to taste. I used to have a Breville duo temp just like yours. I also used to live in Maroubra until a couple of weeks ago hah! I started using the duo temp with the standard breville grinder (which I feel is better than the Em0480) and you can definitely achieve good results with this setup, I can personally attest to that. My hunch is your sunbeam grinder may be a little bit worn after 5 years so you should definitely consider upgrading your grinder. I switched from my breville grinder to a Macap M4 and the difference was like night and day. Really proved to me that the grinder is where you should spend your money on. I hope this provides you with some encouragement - that the duo temp is definitely capable of delivering good shots. yep....its probably been 6-7 years for the grinder actually. ....but I'm much happier with the results now. thanks for all the tips. I willl buy a new grinder early next year I think . Far be it for me to discourage you from buying a better grinder, however I would be remiss if I did not suggest you get your EM480 shimmed - it used to be a free kit from SB, these days I do not know. Look it up on this site. What you described is just the grinder going out of adjustment with age & usage - i.e. you have run out of adjustment at the fine end of things. FYI the older 480s are pretty solid, so it probably just needs its first lot of tlc. After that, what condition the burrs in your 480 are in is anyones guess... they also take a fair bit of a hammering and are also a pretty cheap replacement item. BTW, the "smartgrinder" and the older EM480's are lineball in terms of quality. If you are considering a grinder upgrade then you should probably go "upmarket" a fair way. Hope this helps you enjoy your cuppa - your gear should do that much. IMO its best to look at a single variable at a time, and the first one that is the MOST important is distribution. If you don't get a consistent technique down it really can result in bafflingly inconsistent results. I use, practically speaking, stockfleths move, which I find to be very consistent. Also, regarding tamp.. this opinion is probably unpopular, but I use maximum possible tamp pressure. There is only so much a solid can be compressed. But as you can see, I think that consistency of technique is key. Some disagree, but if you tamp always as hard as possible, you always compress the grounds to their maximum compression regardless of grind or beans or the grinder or even the distribution. Do you have unpressurised baskets? I used to own the same grinder and found it worked alright but in time when I started getting right into coffee it clumped alot,made alot of mess on the bench! pressurised baskets will allow you to make mistakes with tamp and grind size, unpressurised not so much. stick with the double, I struggled with single baskets as they are a much more precise thing to try work on and really it isn't worth it! I use the 1:2 ratio of 21g in 42g out in 25-27 seconds. Bought myself a cheap rancikio Rocky doserless and am happy with it, ut recently upgraded from a sunbeam EM6910 thermoblock to the breville bes920 dual boiler and couldn't be happier. Great reading. 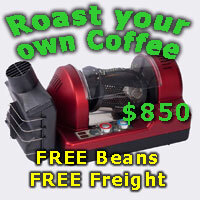 I have been using an EM 6910 and EM 7000 with an EM 480 grinder. Usually with great taste results. However, I decided to give away an EM 5600 and 4800c, so decided to make a coffee with them. Found I had lost my touch and made bitter coffee. Went down to 13gms in the basket and the pour was too fast, but the taste was ok. Previously at 14.5/15.00gm it was bitter, and the grind has to be coarser than the grind I use on the 7000. Maybe I will have to go back the early "excellent reply post" and relearn the basics. I need to, I have a 4820 in my campervan, with a 440 grinder. And I can't stand bitter coffee!